"Reading this book may help children who get frustrated at having to do a task more than once, showing them that some jobs are ongoing and require consistent effort. Children may also enjoy brainstorming creative ways that Handy Bob could enlist help to keep the gym floor clean." "Part of our school community is the custodian, and this story gives the children insight into his never-ending job! At Lakeside School they call their custodian ‘Handy Bob,' as he can handle any job! Throughout the day various groups of children pass through the gym and leave behind footprints of mud and grass and bits of crumbs and drops of paint. By the end of the day the second-grade gym class is slipping and sliding through the goo making figure eight's. Bob cringes as the marching band comes through at the end of the day but is pleasantly surprised to find that the goo sticks to their shoes and the floor is clean when they leave! "This is a fun read-aloud book. Children will love Travis Foster's illustrations that are enhanced with a glossy finish over the areas where there are messes on the gym floor. As Handy Bob leaves the clean gym he is unaware that he is leaving a glossy trail of footprints of his own! The kindergarten classes at Meadow View give it a ‘thumbs up'!" "Children will enjoy this book immensely. The illustrations have a unique and entertaining perspective. The entertaining story of Handy Bob of Lakeside School is told in rhyme that is wonderfully lyrical and should be read aloud to be fully appreciated. 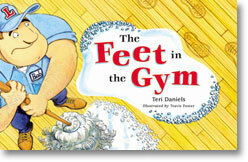 The Feet in the Gym is a wonderful book for a shared reading experience. . . . This book could be useful in career studies. It could also be used in the classroom to teach consideration for the maintenance staff at school."